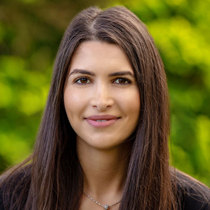 Nadine first developed an interest and passion for Family Law whilst studying at Western Sydney University which, combined with her interest in English and History resulted in her choosing to specialise in this area of law. Prior to joining the team at Rafton Family Lawyers, Nadine was employed at a leading Sydney-based specialist family law firm where she gained a strong knowledge base in all aspects of Family Law. Prior to her admission as a solicitor in 2018, Nadine gained over four years’ practical experience as a Legal Assistant in family law. Nadine’s role as a Legal Assistant allowed her to develop a deeper understanding of complex family law issues whilst she assisted special counsel in both parenting and property disputes, including divorce applications, relocations cases and preparation for Interim and Final Hearings. Nadine’s compassionate and friendly nature combined with her pragmatic and detail orientated approach enables her to understand and assist with the needs of her clients. Nadine understands the emotional toll family law has on her clients and tries in all aspects to minimise the disruptions in their lives. Nadine has a strong knowledge of court procedure and has extensive experience in communicating with clients, solicitors and barristers and has represented clients in the Federal Circuit Court of Australia and the Family Court of Australia.